How much do you participate in your community or in your artistic field? Not just in selling your wares and promoting yourself or your goods – but actively helping organizations that you are surrounded by? Is there an organization within your community that you admire for what they do? Is there a professional organization that fosters new artisans/artists? Is there a group that helped you in the past? I live in a small rural community. Every organization (and there are a LOT of them) fundraise to meet their expenses or to achieve their goals. They are all run by volunteers. I have found that I no longer have the time to sit on stalls all day, to spend a day baking, or to help organize a fundraising function. However I do have a product that people appreciate and want. This makes it ideal for me to support these organizations by the donation of a piece of jewellery. The jewellery is either raffled or auctioned – either way someone gets some lovely jewellery and the organization gets much needed funds! Of course, they don’t ALWAYS want jewellery, but three or four times a year I will donate an item or two to organizations in my local town or the surrounding district. And you know what, it feels GREAT! How about supporting a local artisan group by giving lessons or talks to young people interested in getting into the artistic field? Encourage their efforts and support their endeavours. Hopefully your generosity will inspire others to do the same. And you will benefit by getting the satisfaction of strengthening and helping your community. This coral, lava and silver necklace raised several hundred dollars for a neighbouring school. To read more by Annette, see her blog, Under the Loupe and view her jewellery at www.annettepiper.com. A lot of people ask me how I manage to create the pieces that I do. Its not that they’re that complex, but even simple pieces can take a lot of organizing! 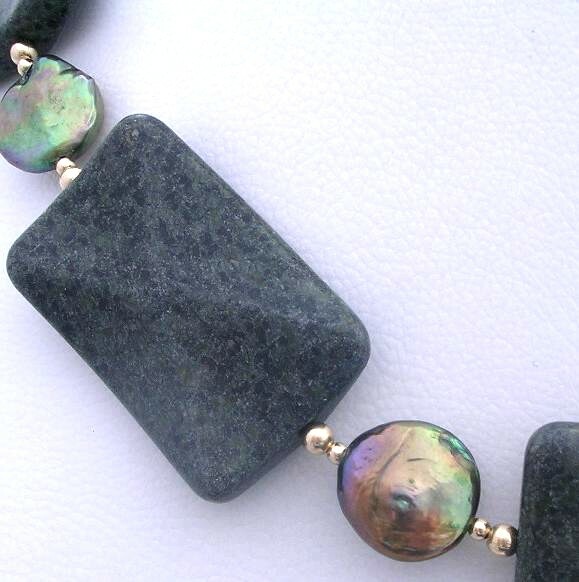 Unlike some designers who start with a design in mind, I start with a beautiful stone or strand of stones. Beautiful to me of course. When I look at them I see the possibilities of how they could be in a finished piece that would be attractive to wear, even if they don’t look that spectacular all by themselves. Some pieces you just know are going to be stunning and going to be snapped up quickly. Others may quietly achieve and these can’t be discounted as there has to be items for those people who don’t like their jewellery to loudly announce their presence. Once I have the stones I look at the colour, patterns, texture and automatically, possible combinations are being imagined. I consider them all and those that may have some merit I haul out and place next to the stones, to see if there is that ‘spark’ that will make them irresistible, or whether there is a gentle acceptance of each other. Sometimes the possibilities that I imagine so vividly end up sitting there with their backs to each other in a standoff situation. It’s okay, I realize I’m not always right. After the basic combination is there, this is followed by moving things around and often a partial mock up to see if it will work. Once that shows promise, it is ready to be completed. With some of my more complex combinations it starts off the same way – to see if the individual stones looks great together. Once I have that right, then I start tipping quantities into a container and keep adding to the mix until the overall look is ‘just right’. Then comes the construction. It can be quite a lengthy process. The actual creation time may take half an hour or it may take days. (Some pieces are very reluctant to change their state in those latter cases!) The actual construction is usually fairly fast, but I have to be in the ‘mood’. If I’m not, regardless of how good the combination is, it just won’t have the pizzazz of the pieces I make when feeling quite passionate about them. It could reasonably be said that there is a little bit of me in all my pieces – through the creations process of my inspiration, my skill and my passion. So when people buy my jewellery, they are buying a little touch of me too. It is so easy to get caught up with work. As often struggling artists/artisans we put 110% into our work – to creating, to promoting, to selling and we often fret when we are prevented from doing so. Sometimes we have to step back, take a breath and a good look around us and assess our lives. The old saying that you should “work to live, not live to work” is true. Admittedly some amazing artists put their lives on hold while they worked and worked and worked. And the body of work they created has afforded them a measure of fame (often after their decease, however). But what was the quality of their lives as a consequence? We mustn’t let our health suffer – we must take time to stop, to rest, to eat healthy foods and to get sufficient exercise. Our minds are important too – we need time to reflect, to refresh our perspective, to recharge our batteries. To let new ideas flow and new creations emerge without being forced. What about our families? The love that our families can give us and the esteem in which they hold us will be for the type of person that we are, not just for the art we are able to create. Do you want to see your children grow and be a part of their lives? Do you want to be a valued and integral part of your family’s life? 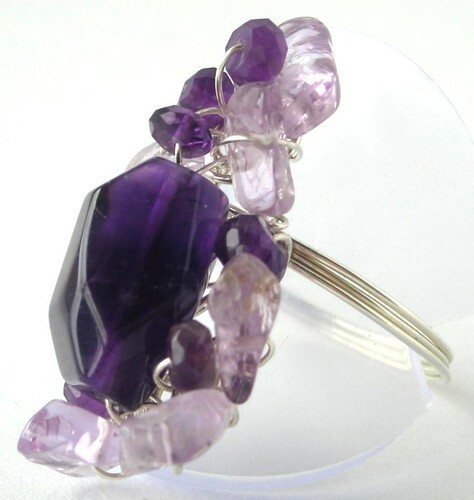 When I started designing and creating jewellery, things accelerated incredibly fast. I found myself busier than I had ever been and surprisingly stressed at the success I was experiencing. But I was too busy to do things with my family and I also became very ill. Even though becoming ill was unpleasant, it made me stop and assess – and I realized that, for me at least, living my life and being enriched by my art, but not controlled by it, was the key to my lasting happiness. And years down the track, it is still working. Keep your work fresh and new with a balanced look at your life.